Welcome to another week of linking, reading and being nosey, yup I realised that blogging is like a 1950’s version of seeing what you’re neighbour is up to, what they’ve bought, sharing big events – only without the fence and even better that neighbour might live in a completely different culture. I’ve got a new guilty pleasure as my featured blogger this week; guilty because I often pick them. Three times Daddy has written an awesome summary pondering whether our children are happy. Once quoted to be the ‘happiness fairy’ I couldn’t help but be drawn in to his thoughts on how we can role model happiness, care more about others and of course (my personal favourite) PLAY more. Don’t take my word for it, hit the link here and read it for yourself. It really is an important topic to give time to, not only to fill our own cups up but also we are in a mental health thunderstorm, so modelling or providing a tool box for your children to be able to retain their own happiness is essential. Then role modelling it by playing along here by joining in with week 51 and clicking the blue box below. Don’t forget other people #caringissharing and please comment on the necessary posts. You can also see who Hayley my cohost has picked, by jumping over to her site. Lost in a world that doesn’t exist. We are all absorbed in a world that often isn’t what it seems, always learning new things and what I’m going to share blew my brain. Its an experiment conducted by Dr. Masaru Emoto, where cooked rice was put in three beakers. Dr Masaru then speaks to the beakers daily (or shouts), you can also label them. The results blew my brain and I invite you to try it yourself. a permeant marker to label the jars, or a sticky label and pen. My bestie and I were talking about the experiment and I have to say, I was intrigued. I seized the day and grabbed three jars. I labelled my three jars gratitude, disgusting and ignore. I placed a teaspoon of cooked rice in each jar, let in cool and then sealed it. I then spent the next few weeks daily telling each jar how thankful I was for it, how revolting it was…or I ignored it. Over the next few days and weeks I then sent the following photos to my bestie and we exchanged thoughts on the experiment. A good google will give you lots of scientific analysis and tell you more information on the experiment, below are my results after thirty days. When I opened the jars (outside in the garden) the gratitude jar has no sign of fermenting, it smelt sweet but not necessarily pleasant, I really couldn’t believe how clear it was. The disgusting jar was very different – the smell packed a punched and the rotting is clear to see. I could see at least five different types of mould. The ignore jar looked clear too (which surprised me) the water in the jar was a little cloudy, however when I opened the jar the smell was unbearable and I’ve changed many nappies at close range. 1). If humans are approximately 60% water and water has a conscience- then how we speak to ourselves and how we let others speak to us has much more of mental and physical effect than I ever perceived. Since doing the experiment I am much more aware of my inner voice and the thoughts I choose to think, I also avoid being around others that could poison my jar. If the conversation turns negative, I make my apologies and leave. 2). Now I understand why my Nanny talks to her plants. If rice in a jar can be THAT effected by negative words, objects I once thought were just that – objects, are much more sensitive to their surroundings. *at this point my brain slightly blows with incomprehensible truths about the world we live in. If the sea, plant life and animal kingdom are all receptive to the energy projected at them then the first place to start being kind is to ourselves and then to spread the kindness and gratitude like…water. 3). My son was part of this experiment but I will do it with him again when he is slightly older, I hope it will teach him about his inner powers. This last image is powerful but again, don’t take my word for it. Grab yourself a jar or two and let me know how the conscious rice experiment works for you. Nifty fifty…i’m so excited, we need to celebrate. fifty weeks (give or take a cheeky holiday) of me being consistent in my blogging approach. My Mr describes our relationship as a balloon, in essence I’m the balloon – a spontaneous, hot air, rising high without little thought to consequences, whilst he is my string. Solid; holds me still and stops be floating away. So for me to be consistent for fifty weeks is a huge deal. 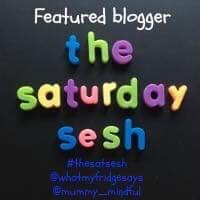 I’m in total gratitude to my cohost – my string on #thesatsesh the mindful hands full Hayley (you can check out her featured blogger here too) I’d also like to thank all of our regular bloggers who join us week after week, our newbie #thesatsesh peeps and of course you for reading. For week fifty I felt like not only did I need a ‘fridgesays’ vibe post as my featured blogger, I also needed a blogger I admire. Mrs rose tinted life is so my kind of lady, I know one day we will sit down and have a glass (or several together), her post on cough cures made me chuckle and also resonated with me. As a family we try to reduce chemicals where we can, reuse, recycle and make a little less global destruction on this planet, we also don’t really take medication. I say ‘really’ as I have delivered my children via C-section, but we avoid prescription medication where we can. We use most of the cough cures that her elderly neighbour mentioned and I strongly believe that most cures are found in nature. Well done to the lovely Berni, she is a wonderful human and joyful artist, blogger, BnB host…and so much more. Jump in to week fifty and read the rules below if you can’t remember the small details. Once again, thank you for joining us and happy week 50! I know these aren’t real words, but so much of my vocabulary that I use is created in my head, this spoke to me. When I was younger I really felt that once you became an adult you had the world worked out, the pathways would open like some sort of ‘open sesame’ then on you plodded. Well either I wasn’t listening when they were handing out maps (highly likely) or the routes of life are more unknown than I had thought. Problems, often cascade from no where. They arrive on my doorstep in envelopes of large bills that I wasn’t expecting, a car can collide into my rear and phone calls and more letters are required. The health of loved ones can be shared in a text or conversation and then hospital visits and worry ensues… or you can breath. I know, breathing doesn’t actually pay the bill or fix a car, but it does allow your brain to process the issue from a grounded place rather than in a state of emotional turmoil. Often when I’m faced with an issue that I can’t figure out how to solve, changing the activity I’m doing or distracting my brain with something I enjoy often means I come to a conclusion far quicker. It sounds crazy, I realise to say ‘don’t think about the problem you can’t stop thinking about’ but honesty it works. My dear friend couldn’t conceive, her partner and her stopped trying whilst they saved for IVF…with the pressure removed she conceived and gave birth to a health bundle of new born. When you ‘let go’ of tension magic happens; money flows from places you didn’t know existed, friends help out in ways you didn’t know they could…issues that you just couldn’t work out become figureoutable. Happy weekend all, this week saw my Uncle get hitched and I was gifted a wonderful yoga session. I met up with friends and finished with a GnT and a take away pizza – call me classy. I hope the week has been kind to you also. Hayley my lovely cohost has elected her featured blogger, so feel free to check it out here or read on to find out that my gorgeous featured blogger is the stunning Mummy Wales who gave us all eight great ways to get kids engaged in nature. Making time to get outside every weekend is something we prioritise, I loved her enthusiasm for county shows – Okay, she mentioned gin and cows eyelashes, but lets be honest both of those things are delightful. This post reminded me of my own values and I made time to take the little dude on a midweek welly walk (before the nights draw in) we collected some conkers and pretty leaves. So thank you to Mummy Wales for an authentic and joyful post, please collect a featured badge from my side bar. If you can join us this week, then please read the rules below and click the blue inlinz box. We really are grateful for so many of you joining us week after week.